Collection of original technical drawings of Robby the Robot from Forbidden Planet, from the collection of Cinefantastique publisher Fred Clarke. (MGM, 1956) A collector of all things Forbidden Planet, Fred Clarke gathered together one of the most extensive collections of FP material anywhere. Here are the prop department's blueprints for one of the greatest robots in cinema history: Robby. Clarke's obsession created one of the finest issues of CFQ. Clarke's love of the film is quite evident, as it's one of the few CFQ cover stories that he actually took a byline for, and even commissioned Vincent Di Fate for a Forbidden Planet wraparound cover which was the pride and joy of his personal collection, a painting he would never part with. 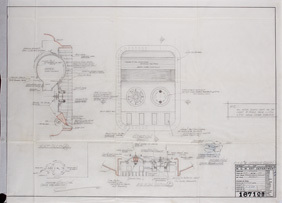 Portions of these blueprints were reproduced on a promotional poster for the magazine as well as inside the FP double issue. 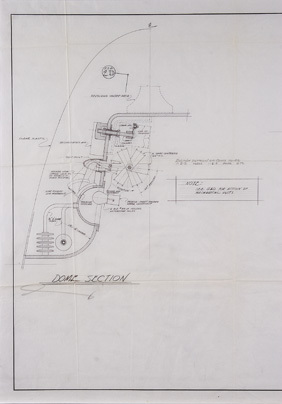 As an important artifact of Hollywood history, these drawings, ten in total, consist of both original technical sketches done in pencil, as well as blueprints and brownlines. They detail the mechanical workings and exact specifications of many of Robby's key components, including the Hopper Panel; the Dome Section; his gauntlets including various tool adapters and his pincers (four drawings); a technical drawing of his voice tubes; what appears to be the swiveling torso section holding one of his arms; a drawing of his antennae, and a brownline of his entire outer form from head to toe. Various sizes from 20 in. x 31 in. to 41 in. x 51 in. Interested bidders are strongely encouraged to view this lot in person.